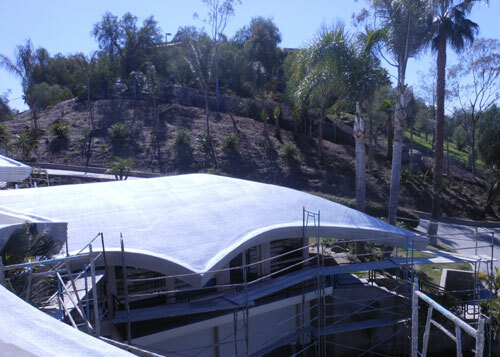 Sprayed polyurethane roofing systems (SPRS) are the competitively-priced, durable alternative to roofing or re-roofing your commercial or residential property with traditional roofing materials, and are becoming increasingly popular for use on both new and existing flat-roofed homes and businesses. Spray polyurethane foam provides an extremely strong, yet lightweight waterproof roofing system which has the capability of bonding tightly to nearly any prepared surface, and is ideal for use over existing built-up roofs, cap sheet roofs, gravel roofs, metal roofs, standing seam roofs, and hot mop roofs. Moreover, spray polyurethane foam roofing systems are comparable in price to these traditional roofing systems, but possess a far greater energy efficiency rating. In fact, depending upon the season, home and business owners who install foam roofs notice a substantial reduction in their heating or cooling bills immediately following roof installation. 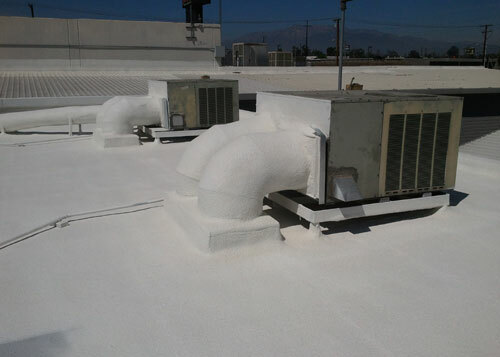 At Corona Coatings Corp., our skilled roofing technicians can typically apply our spray foam polyurethane roofing system directly over an existing roof, precluding the need for a costly, disruptive tear-off of the old roofing system. And while the seamless nature of foam roofing systems makes them highly resistant to damage, if mechanical damage to the foam membrane ever does occur, the required repairs can usually be performed with only a caulking gun and sealant. Moreover, with proper maintenance, the average life expectancy of a spray polyurethane foam roof is 12 to 14 years, after which time, the existing foam roof can easily be recoated, and granted a whole new lifespan. 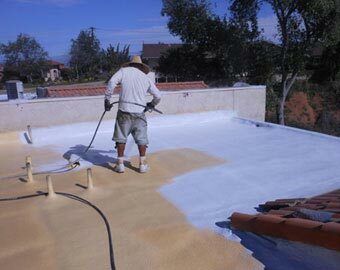 At Corona Coatings Corp., we stand behind our superior spray polyurethane foam roofs with a ten year warranty. We are proud members of the Better Business Bureau (BBB) and the Spray Polyurethane Foam Alliance (SPFA). Call us today, and join our thousands of satisfied customers throughout the Riverside and San Bernardino. Corona Coatings Corp. is licensed, bonded, and insured. Proper maintenance is vital to the life expectancy of your home or business polyurethane foam roof. At Corona Coatings Corp., we offer an annual routine maintenance service, during which our roofing professionals will come to your home or business and evaluate the integrity of your foam roofing system. They will first thoroughly clean the roof, removing all debris from its surface as well as from all rain gutters and drains, and then assess the condition of the roof. They will then determine if repairs to the system are needed, and only recommend the most cost-effective repairs necessary to prolong the life and optimal functionality of your residential or commercial foam roofing system. 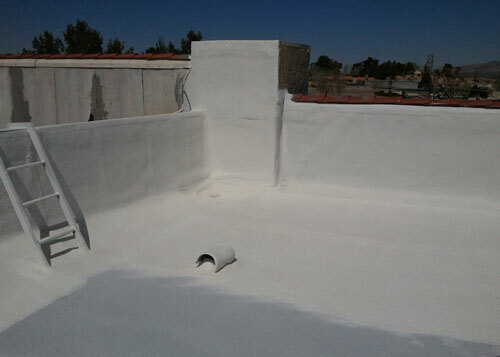 At Corona Coatings Corp., we offer free on-site foam roofing system inspections, during which our qualified foam roofing professionals will carefully evaluate the functionality of your residential or commercial foam roofing system and recommend repairs as needed to keep your foam roof functioning exceptionally. In Addition, all of our repairs can be custom color-matched to seamlessly blend with any existing polyurethane foam roof color. 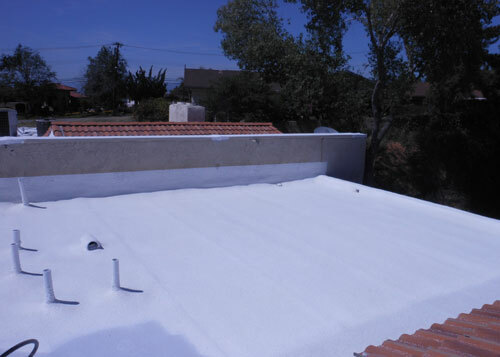 At Corona Coatings, our foam roofing experts can also perform official foam roofing system certifications, required by real estate law on all commercial and residential properties possessing a foam roofing system prior to sale. Thank you Corona Coatings for your outstanding service and hard work. The new roof performs better than our expectations. The roof actually drains and we have not had a single leak. First time in 8 years and we have noticed that our Office Building is a lot cooler. Thanks to the insulation benefit! 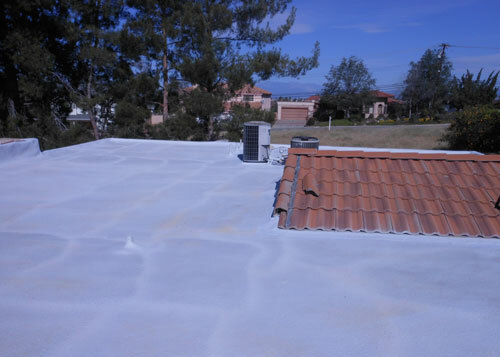 Corona Coatings Corp. repaired this 20 year old foam roof in Riverside, CA. We repaired and recoated this home's polyurethane foam roof to give our client an updated roofing insulation system.